On #GivingTuesday celebrated on December 2nd Hyatt Place Hampi, of the Hyatt Hotels Corporation, awarded Akshaya Patra with a USD $15,000 grant to aid the Foundation in its cause. This initiative was a part of the Hyatt Community Grants, a philanthropic programme that enables Hyatt colleagues to take part in charitable giving. The Hyatt Community Grants programme which has been running for seven years is celebrating its milestone of reaching two million dollars in grant funding since its inception. 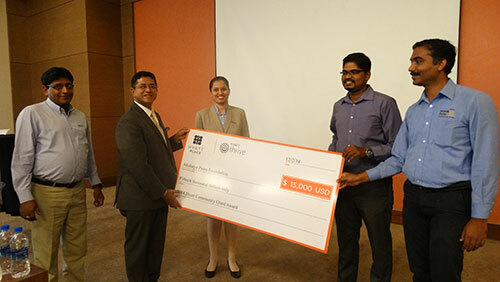 The grant was presented at the Hyatt Place Hampi to Sooraj Ravindran, Manager, Corporate Partnerships, and Chetan D, Manager-Operations, Bellary, representatives of Akshaya Patra by Sameeth Guha General Manager; Debasish Shah, Executive Chef and Kanika Mehra, HR Manager, of the Hyatt Place Hampi. Hyatt Community Grants is a part of Hyatt Thrive, the company's global corporate responsibility programme. Through Hyatt Thrive and the combined support of over 95,000 Hyatt associates from over 570 properties globally, the Hyatt Hotels Corporation makes a concerted effort to create a positive global impact. We are proud and grateful that Hyatt Hotels has chosen to partner with Akshaya Patra on this special occasion of #GivingTuesday.